Halifax coach Richard Marshall admitted his side’s part-time status was a factor in Friday night’s 44-16 Challenge Cup reverse at Wakefield. 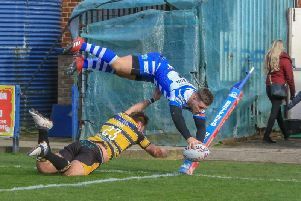 Fax were in the contest against James Webster’s Super League outfit for long spells and were only 22-16 adrift until the 60th minute, when a Craig Hall solo try sparked a late landslide of points. “The full time factor told towards the end,” said Marshall, who now has nine days to get his side ready for a crucial Championship fixture against Sheffield at Doncaster next Sunday (4.15). “Probably two thirds of our squad were at work yesterday; on roofs, cleaning windows, whatever. “If I’m being honest, that’s what got us in the end because you can’t prepare or train as they can. “That’s not an excuse, just the reality. “They racked up a few points towards the end, which I didn’t feel was a reflection of our performance or our attitude within the game. Despite their current status as the top flight’s whipping boys, the Wildcats still had the edge in attack, with Australian half backs Tim Smith and Jacob Miller combining with Hall and former Leeds dangerman Ali Lauititi to offer a constant threat. “Lauititi had a great game and Tim Smith really bossed them around the park,” said Marshall, who revealed his own dangerman, the young full back James Saltonstall, had been nursed through the second 40 minutes after pulling his hamstring. “But I thought Scott Murrell was outstanding in that first half; his kicking game was great and he really got us organised. “Our shape and our plays were good, but we probably didn’t give ourselves enough chances to put them on. “James Saltonstall tweaked his hamstring in the first half; not badly enough to come off, but badly enough to leave him on one leg in that second half.